Equipped with 4 A-RB stainless steel ball bearings for long-term reliability. Very smooth; high retrieve speed. Diecast aluminum frame, aluminum spool and sideplates, handle-side VBS centrifugal brake, Super Stopper anti-reverse plus Assist Stopper. Recessed reel foot puts the reel closer to the rod for comfort and leverage. 400 Series reels have non-disengaging levelwind and clicker. "This reel has excellent construction. It is the easiest to dismantle for cleaning of any reel I have ever used. The drag is excellent and the reel winds very smoothly. Can't beat this reel." "This reel is great on handling large swimbaits. I have used Slow Sinking BBZ's and other 5+ OZ swimbaits on the 400 model and the reel performs perfectly." 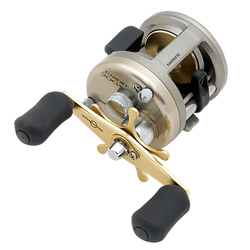 "like i stated this is the best $100 reel i have ever used. i only bought one but i soon will have more in my rod box! it is very smooth and cast very well."